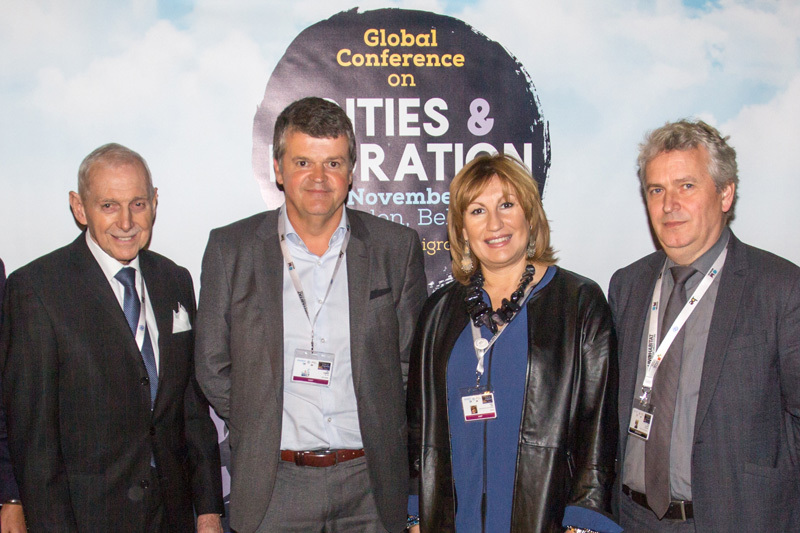 Mechelen – The Global Conference on Cities and Migration is currently being held in Mechelen, Belgium (16-17/11). Hosted by the Belgian Ministry of Foreign Affairs, Foreign Trade and Development Cooperation and the City of Mechelen, the conference is co-organized by partners UN-Habitat; IOM, the UN Migration Agency; and United Cities and Local Governments (UCLG). The conference seeks to help promote a more positive narrative on migration from the perspective of local and regional authorities, recognizing that people migrate mainly to cities and to reinforce the need to recognize local authorities as key actors in migration management and policy making, as reflected and embedded in the process of the Global Compact for Migration (GCM). Cities and Migration gathers more than 150 representatives from Local Authorities and Associations and Networks of Local Authorities, representatives from UN agencies, foundations and the private sector. Over 50 cities from Europe, North, Central and South America, Asia and Africa are represented. The conference serves as an opportunity to consolidate local governments’ contribution to developing a Global Compact on Migration and to review progress in the implementation of the migration-related commitments of Habitat III, ahead of meetings in Mexico next month as well as the 9th World Urban Forum scheduled for Kuala Lumpur, Malaysia in February 2018. “[Mechelen was chosen as the host city] because of its excellent track record on migrants' inclusion. The city has chosen not only to accept its super diversity, with 138 nationalities for a total of 86,000 people, but also to embrace it as the new normal,” said Bart Somers, Mayor of Mechelen. “The universality of the 2030 Agenda should help us change policies on migration around co-creation and right to the city and recognise that Local Government networks have a responsibility to foster this change with the support of the national governments and the international community,” added Emilia Saiz, Deputy Secretary General of UCLG. The main outcome of the conference is the Mechelen Declaration, which is expected to capture the voice on Cities and Migration by Mayors and Governors of Regional and Local Governments. The document will be submitted to the Special Representative of the Secretary General for International Migration (SRSG), Louise Arbour, and co-facilitators. “We hope that the findings and conclusions of this conference will contribute usefully to the HABITAT III follow up process and to the Global Compact on Migration, through the Declaration that this Conference will endorse,” said William Lacy Swing, IOM Director General. For more information, please contact Géraldine d’Hoop, IOM Belgium and Luxembourg, Email: gdhoop@iom.int, Tel: + 32 2 287 74 12, +32 473 281 846 or visit the website of the conference: www.citiesandmigration.com.